"The aim is a person who is organized to move with minimum effort and maximum efficiency, not through muscular strength, but through increased consciousness of how movement works." Moshe Feldenkrais (1904-1984) is world renowned for the system of body-awareness and exercises he developed during his lifetime. 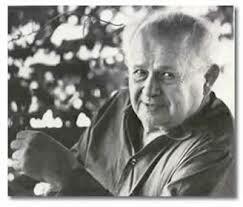 Moshe Feldenkrais studied engineering and went on to receive his doctorate in physics from the Sorbonne. While in Paris, he was attached to the lab of Joliot-Curie (Nobel Prize winner) and gained his Judo black belt with help from Professor Kano (creator of Judo). Over a period of 40 years, he synthesized his learning into a method of somatic education which facilitates each student’s ability to act efficiently and effectively. A Feldenkrais Teacher uses his/her words and hands to direct your attention to sensations of movement, often in ways that you last experienced in childhood. This refreshed image of yourself enables greater ease and precision in all actions. A Feldenkrais Teacher verbally instructs an individual or group through gentle, sequenced movements, while asking questions which direct attention to differences in sensation. Participants learn at their own pace and in their own way, putting sensing and moving together to reduce unnecessary effort.